By the mid-1960s, the hour for Modernism was growing late. 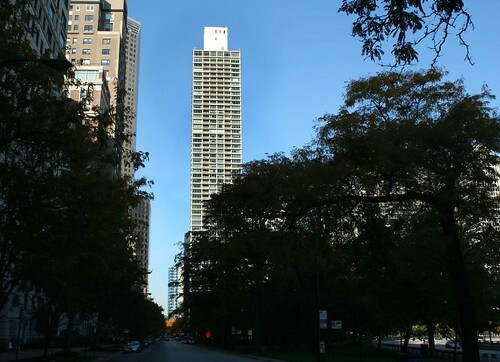 High-minded design ideals had largely (ahem) left the building when it came to multi-family residential development – even the city’s most expensive and luxurious tower paid little heed to exterior design. 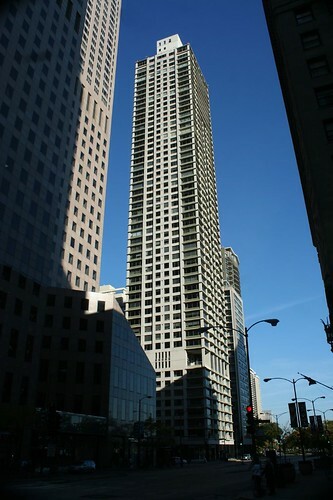 1000 Lake Shore is a 55-story reinforced concrete building, a tall (590 feet) and slender tower with a low garage box attached to the back, fronting onto Oak Street. 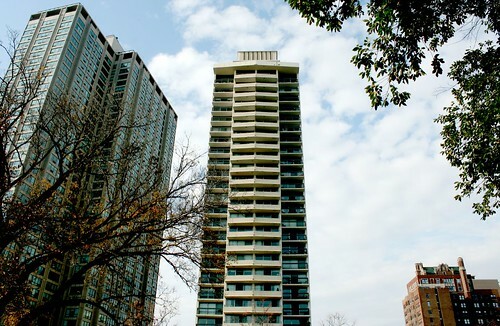 The building held 137 apartments, at 2 and 3 apartments per floor. 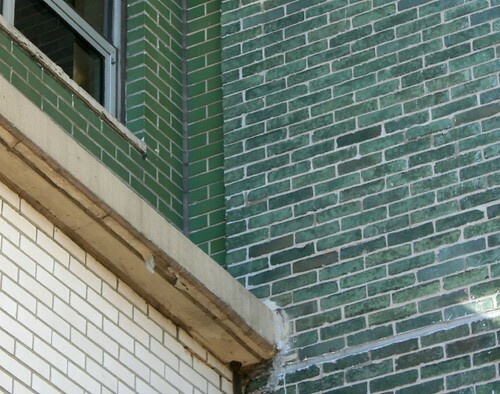 The garage and the building’s spandrels are sheathed in glossy olive green brick that’s close to, but not quite a match for, the cladding on the older 1000 Lake Shore Drive building next door, by the same architect and developer. 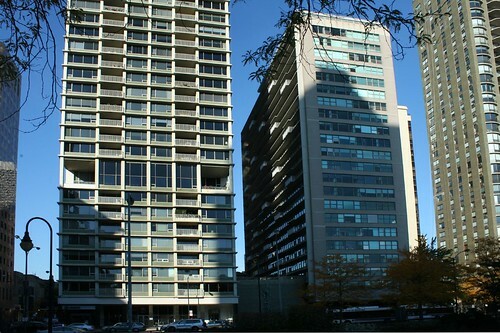 Left, 1000 Plaza; at right, the older, more textured bricks of 1000 LS Drive. 1000 Lake Shore Plaza, was a big deal in its day. 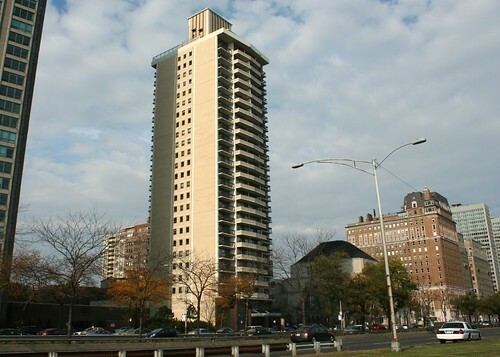 Developed by Harold L. Perlman, the building was widely touted as the tallest reinforced concrete apartment building ever built, as well as Chicago’s most expensive and most luxurious residential address. The tower was billed by a book-sized sales brochure that cost some $5 a copy to produce and promised “the right to be pampered with luxuries not available even to Cleopatra”. Ground was broken in January 1964 in a ceremony attended by Mayor Daley. 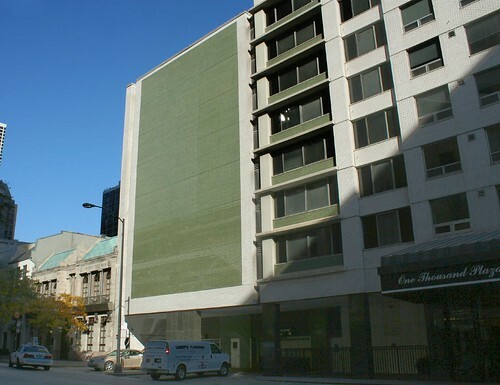 On the building’s tall, narrow mechanical penthouse was a transmitter used by the Chicago Educational Television Association’s channel WTTW Channel 11, donated rent-free by the building’s owners. Drawn by the public generosity, Illinois governor Otto Kerner spoke at the December 28, 1964 topping out ceremony. Amenities included a 9-hole putting green on the garage roof, which should immediately make clear who the target demographic was. Other luxuries included a pool, sun decks, and a “fine restaurant”, commissary, and valet shop on the premises. 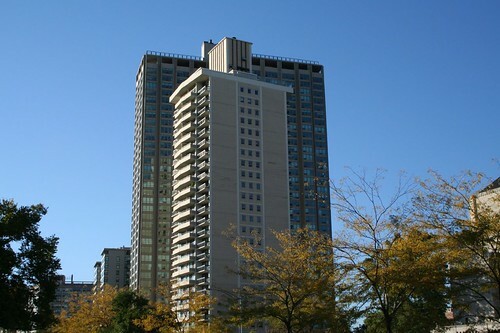 Even more than other Lake Shore towers, 1000 Plaza was hyped by its owners: “the most beautiful and spacious apartment in America”, for “sophisticated men of affairs”, aimed at “136 of Chicagoland’s finest families”, “rising majestically to become the tallest apartment building in the world.” The apartments were “designed to satisfy every fastidious desire”. Rents ran as high as $1,400 a month. One item I haven’t been able to figure out is the faux double-height space seen above, on the 8th or 9th floor. It corresponds to the top of the garage and presumably contains access to the rooftop putting green space. The balcony space is doubled in height, but the interior floors seem to continue on as normal. 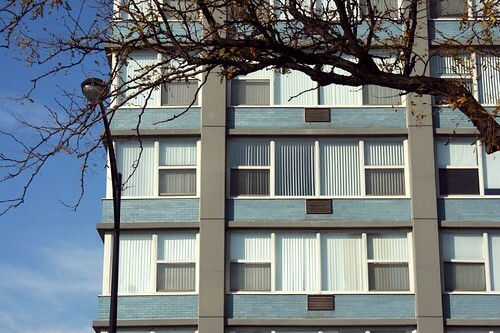 Clad in textured blue brick, the design ideas of this common apartment tower are hardly distinguishable from those of its high-priced cousin at Michigan & Oak Street. The design is an exposed concrete column structure, with glass and brick infill. 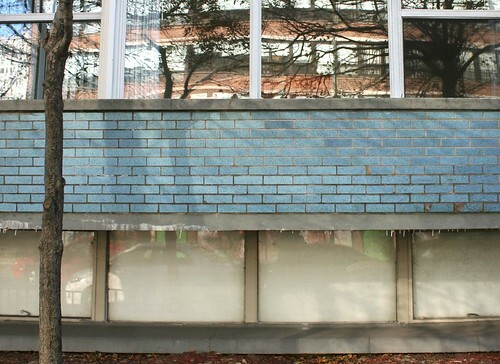 The major point of interest is the handsome blue brick itself. 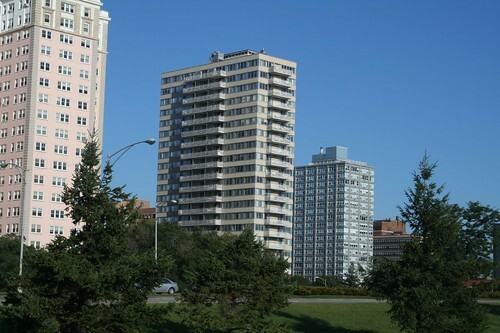 Opened in May 1961 as the 5650 Sheridan Road Apartments, the building featured a rooftop sun deck and solarium, still present today. 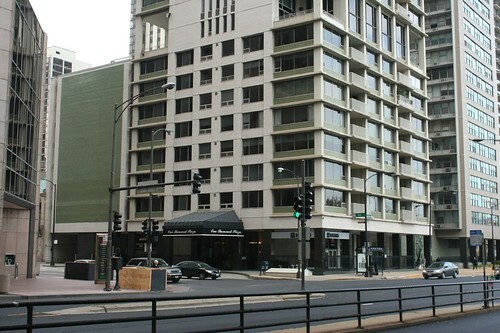 Studio apartments started at $130 and 4-rooms at $165. Just around the corner geographically, but a world apart in design terms, is the Statesman building – one of the lakefront’s finest buildings, in my opinion. 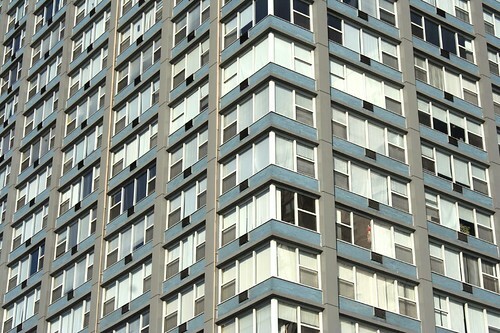 The building’s profile is wrapped in continuous horizontal bands, broken up into a zig-zag pattern by the projecting balconies. The balcony rails enhance the horizontal motif with their slender horizontal railings. 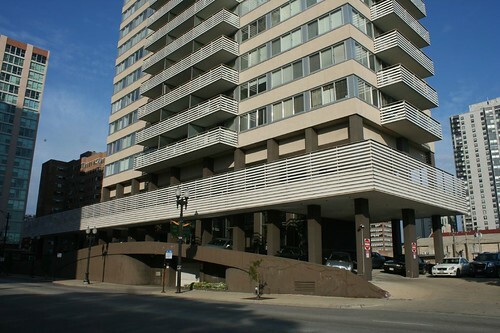 The ground floor is an odd departure, with a startling driveway and parking ramp that curves up over a ground floor garage entrance. Shoehorned into the tight space, amid descending columns, is a double height glass lobby. Capping off the semi-private spaces is a large full-wrap balcony that extends itself out to become a sun deck, sheltering additional parking spaces. 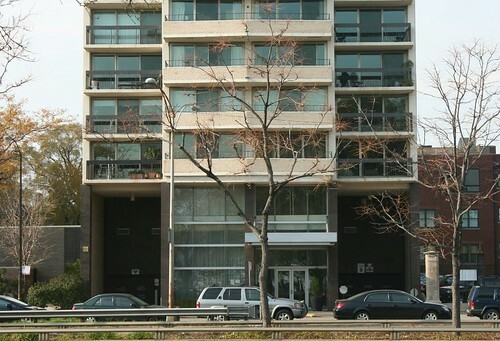 Above, the building holds 90 condominums, mostly 1- and 2-bedrooms. It was converted from apartments in 1979. A few miles south, 3470 LSD provides a contrast to show just how artfully the Statesman was handled. This building likewise uses its balconies to powerful effect in creating horizontal banding on its eastern face – but lets the architectural design completely drop on the equally-visible north and south faces. A powerful composition is left incomplete. 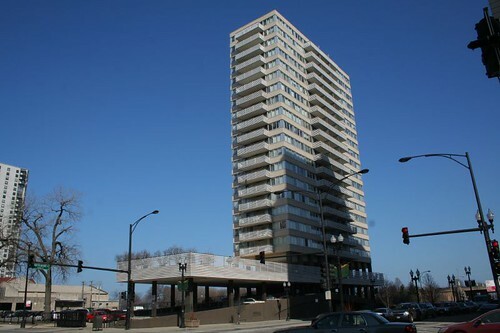 3740 Lake Shore is a 27-story condominium building, opened in May 1967 with one, two and three-bedroom units ranging from $27,000 to $70,000. Amenities include 30-foot long balconies, a 3-story garage in the building’s base, and a pool, sauna and “sky lounge” on the tower’s roof. Larger units include sunken living rooms, and the building provided an interior decorator to help residents finish out their new homes. Like so many other Lake Shore skyscrapers, it rose on the site of a Victorian mansion, this one erected by Robert D. Lay, president of the Chicago Athletic Association. Mr. Lay died in 1940; his house became an apartment building, then was wrecked in 1966. 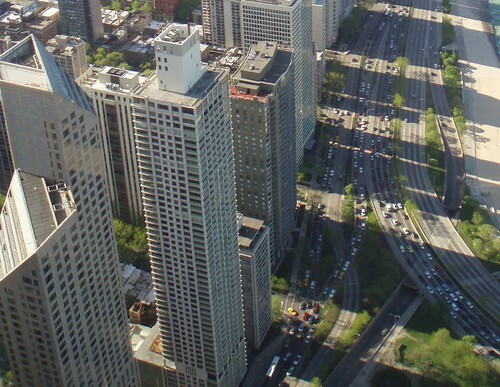 This entry was posted in Aerial Photography & Views from High Places, Chicago neighborhoods, Lake Shore Drive, Midcentury Modernism. Bookmark the permalink. This lady I know has lived at 1000 LSP since Day One and has a Touch-Tone phone, like one you would find in a booth, embedded in the wall by the door. I think that her husband (who financed the lifestyle) died in the early 70s and I don't think that she's made any major changes since then. Her apartment and the building in general is like a time capsule. Appreciate your hard work. Very informative. Your blog is awesome as usual.And I love The Statesman. Robert, very detailed and informative post. Another enjoyable read. 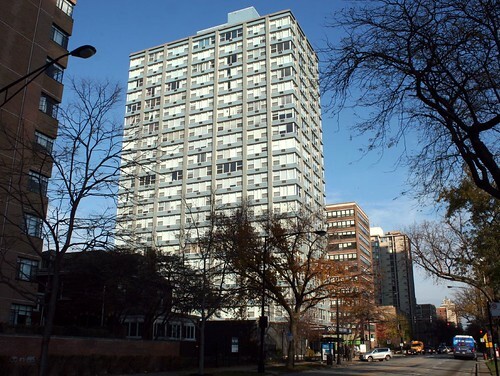 Another great post – Milton Schwartz did a lot of interesting, if not well known buildings. I like the sound of the built in phone too!